What Will President Obama Do For Africa? Senator Barack Obama won the Presidency of the United States Last Night. Beginning Tomorrow Both He and Vice-President Elect Joe Biden will receive Daily Intelligence Briefings from the CIA. What are some of the Things that could Happen? Currently there are Several Areas of Crisis that the United States has an Interest in. The Situation in this Country is a Tragedy in the Making. A Poorly Performing Economy with a High Rate of HIV/AIDS and a Ruling Party that will do anything to remain in power makes for a Great Novel. The Independent Media has been Muzzled. The Political Opposition and the Judiciary have been facing Intimidation unchecked for years at the Hands of the Ruling Party and Security Forces. But the Election of Obama changes everything. In the Past President Mugabe has Accused the US and Other Western Countries of Racism in Dealings with Zimbabwe. The Election of Barack Obama Makes this a MOOT POINT. In Recent Weeks the Long Simmering Tensions in the Eastern Part of this Country has boiled over into Conflict. 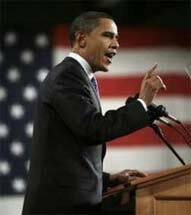 While He was in the Senate President Elect Obama was one of the Main Sponsors of S. 2125 The Democratic Republic of Congo Relief, Security and Democratic Promotion Act. This was signed into Law by President Bush in 2006. How will President Obama react to the Next Congolese Crisis? Barack Obama the 44th President of the United States. There are Several Areas that are Flashpoints or could evolve into one. The Situation in Somalia does not show any sign of Improvement anytime soon. Ethiopia has stated that if there is a Peace Deal reached in Somalia then it will withdraw its Forces. Although it does not appear likely there is a Possibility that War Could Erupt between Eritrea and Djibouti. Tensions between Washington and Asmara are a concern. Another Concern is that over 2,000 US Troops are Stationed in Djibouti. Earlier this Year then Senator and Candidate Obama did call the Rival Leadership in Kenya in an Effort to Diffuse the Fighting that began after the Controversial Presidential Elections there. So Relations with Kenya will be a Priority for the Obama Administration. So until the US is weaned from Oil this will be a Factor in US Policy towards Africa. And Oil seemingly goes Hand in Hand With Terrorism.